With a potential impact of changing 3.5 million lives, LexLin’s Gypsy Gift program is making a difference in equine therapy centers across the United States. 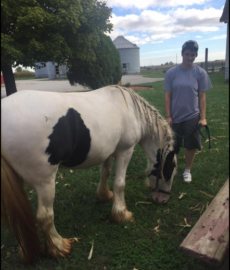 One of those equine therapy centers that has benefited from Gypsy Gift is Kemmerer Village in Illinois. Kemmerer Village has received eight LexLin Gypsy Vanner horses through Gypsy Gift: Snow Raven in 2015; Oreo and Mop Legs in 2017; and Bayley, Bambi, Clover and Crimson in 2018. 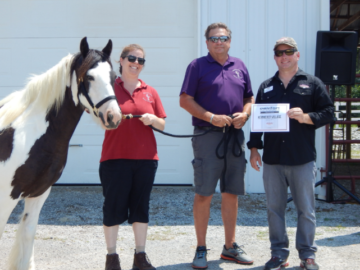 LexLin made its largest donation to date in 2018, donating 58 Gypsy Vanner horses – including four to Kemmerer Village – to therapy centers across the country. The therapy center also received a breeding opportunity through Gypsy Gift in 2015 and raised a Gypsy for equine therapy. The center later named its colt Philip. Snow Raven is decorated by one of the youngsters at Kemmerer Village. Kemmerer Village’s equine therapy program focuses on providing equine-facilitated psychotherapy services to the children in its residential treatment facility. 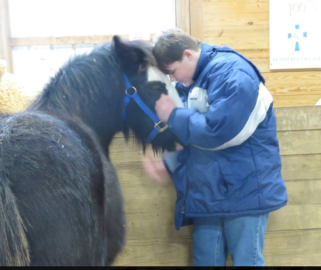 Many of these children have been diagnosed with Post Traumatic Stress Disorder or Reactive Attachment Disorder and begin to learn to build positive relationships through the horses. Initially, many of Kemmerer Village’s equine activities were unmounted, and its herd was built on retired horses, many of whom had health challenges. 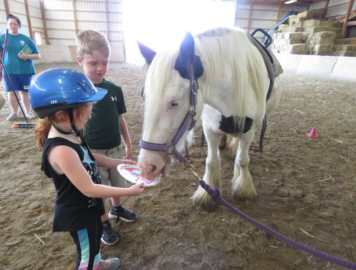 However, the program has grown tremendously in recent years, and Kemmerer Village has added a “traditional therapeutic riding” program for children in the community. 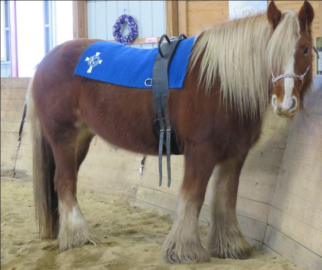 The new therapeutic riding program caused a shift in their equine needs, and Kemmerer Village entered the Gypsy Gift contest in 2015. Snow Raven is groomed by one of the residents at Kemmerer Village. “We are a much smaller program than many PATH Centers and were unsure of our ability to compete. Our posts and pleas for votes were nationwide and incessant! !” Miller said. Kemmerer Village was “thrilled and amazed” to place 8th that year and were awarded LexLin’s Sapphire Snow Raven. Initially, they had their doubts of incorporating a Gypsy into their program. -Gypsies love their people and want to please. -If you establish a good relationship with your Gypsy, you can teach them quite easily without being a professional horse trainer. -Gypsies are incredibly calm which means that their learning process seldom includes the higher risk behaviors often associated with training other breeds of horses. -Gypsies require less feed than many other breeds of horses which brings program costs down. At the Gypsy Gift Ceremony in 2015, Kemmerer Village won the grand prize of breeding to a Gypsy stallion! Kemmerer Village staff accept Oreo at the Gypsy Gift ceremony in 2017. As Philip grew and weaning approached, the children at Kemmerer Village began to process in therapy their own experiences of being separated from their families – a traumatic separation for many of the children at the Illinois facility. They knew then that they needed to keep Mop Legs for the children. “The horses gave them a safe way to discuss separation issues and their trauma. I reached out to Eric, asking if he would consider allowing Mop Legs to remain with the children at Kemmerer Village,” Miller said. During this same time, Kemmerer Village entered Gypsy Gift 2017, hoping that if they placed in the program that it would increase their chances of keeping Mop Legs. Snow Raven accepts a sweet treat from one of its young riders. “Any of the earlier apprehensions that I’d had about ‘green broke’ horses were gone! 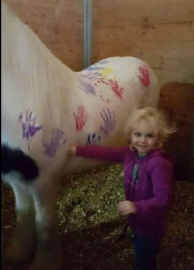 Not only had Gypsy Gift resulted in tremendous publicity for Kemmerer Village – which led to donations to the care and training of our new horses – it had also resulted in my increased confidence that laying the right foundation in a relationship with the right horses makes the rest easy,” she added. During the 2018 LexLin Gypsy Gift program, Kemmerer Village opened its stables to Bayley and her filly, Bambi (another of Thomas’ offspring). The therapy center also received a breeding opportunity through Gypsy Gift in 2015 and raised a Gypsy for equine therapy. The center later named its colt Philip. LexLin Gypsy Ranch has donated 140 LexLin Gypsy Vanner horses to Professional Association Therapeutic Horsemanship International (PATH Int.) 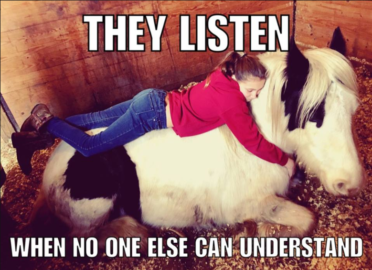 accredited equine therapy centers since 2009 through Gypsy Gift. LexLin expects these 140 horses to facilitate more than 179,775 therapy sessions each year. Over the course of the horses’ lives in therapy, they will impact over 3.5 million potential lives.